Minavar Ulaeva Holiyorovna is a diligent and hardy woman living in Tajikistan. 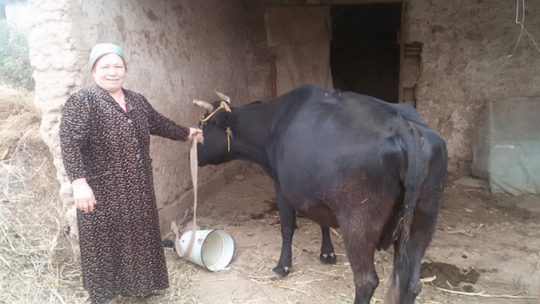 Minavar received her first loan in April 2014 in the amount of 1500 TJS for the crop cultivation. She bought mineral fertilizers, seeds and got a quality and a good harvest that improved her living conditions. After exactly two years, in April 2016, Minavar took a second loan in the amount of 10,000 TJS. With this money, she bought a few head of cattle and seeds. Thus, her activities have expanded, the number of cattle has increased, and she has sowed seeds in time. Currently Minavar repays her loan without any difficulty, as both her activities - crop production and livestock are at a good level. In the future, she plans to get a new loan for developing her business.